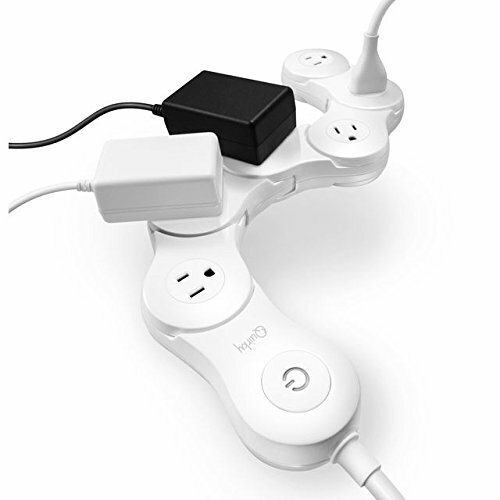 QUIRKY PIVOT POWER 2.0, 6 OUTLET FLEXIBLE SURGE PROTECTOR, WHITE by Quirky Power at Andy Pemberton. MPN: VPVP-WH01. Hurry! Limited time offer. Offer valid only while supplies last. Flexible power strip that bends to fit every sized plug or adapter without wasting a single outlet. No more plug traffic jams and blocked outlets. Flexible power strip that bends to fit every sized plug or adapter without wasting a single outlet. No more plug traffic jams and blocked outlets. Six pivoting outlets accommodate plugs, chunky adapters of all shapes and sizes. 5 ft. extension cord has flat, 45 degree plug to power the hard to reach places. 12.25 in. L x 2.38 in. W x 1.25 in. H.
If you have any questions about this product by Quirky Power, contact us by completing and submitting the form below. If you are looking for a specif part number, please include it with your message.